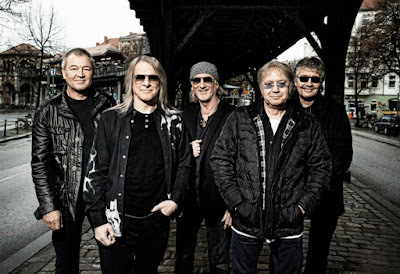 Deep Purple singer Ian Gillan is slamming the Rock And Roll Hall Of Fame for excluding longtime members Steve Morse and Don Airey as part of the band’s 2016 induction. The April 8 ceremony at New York’s Barclays Center will honor most of the group’s first three lineups, including Gillan, Ritchie Blackmore, Jon Lord, Ian Paice, Rod Evans, Roger Glover, David Coverdale and Glenn Hughes. Morse has been the group’s guitarist since 1994 while keyboardist Airey joined the lineup following the 2001 retirement of founding member Jon Lord. “And what a coincidence,” the singer adds, “This morning I got an invitation to a wedding from some dear old friends. Unfortunately my family was not invited and they said that I would be required to sit next to my ex (we divorced decades ago) at the wedding feast. Gillan has voiced his displeasure with the Rock Hall over the years and held nothing back upon word of the band’s nomination in October. “I have no respect for them,” said Gillan. “They’re the kind of people that having seen A Hard Day’s Night decided that The Monkees would be America’s equivalent to The Beatles. They’ve no idea what goes on in the big, wide world outside of their self-arbitrating surroundings. Deep Purple will be inducted as part of the Class of 2016 alongside Cheap Trick, Steve Miller, Chicago and N.W.A.